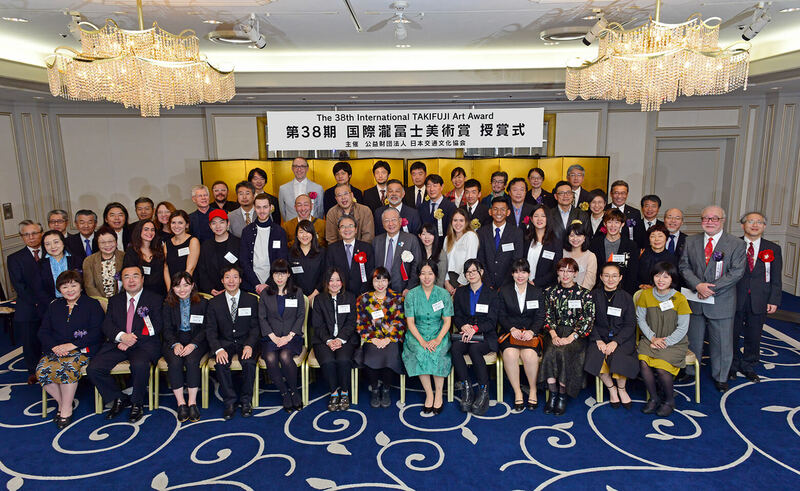 The 38th International TAKIFUJI Art Award ceremony has been held on 11th November at Meiji Kinenkan. At the beginning of the ceremony which started at 5 in the evening, Mr. TAKI Hisao, Director General of our association and the sponsor of the ceremony, gave a speech to congratulate the prize winners. “This art award has started in 1980 and during 38 years, more than 700 students got the award. Among then, there are many well-known artists and teachers active in the forefront of the art world. Please make this opportunities as a springboard to your future and interact each other beyond the schools and nationalities. Get the breath of the world and use it for your good creation”. On behalf of the guests, Mr. MIYATA Ryohei, professor emeritus of Tokyo University of the Arts, made a speech of encouragement to the winners as well. Then Mr.TAKI handed a testimonial and an award to each student. This year 13 Japanese students and 7 students from abroad received the Prize for Excellence, and among them Ms. SHINYA Satoko of Tokyo University of the Arts won glory of Grand Prize, Ms. Adriana AVENDANO ArtCenter College of Design, USA, got International Grand Prize. Apart from them, the special Jury Prize was dedicated to 2 Japanese (Tokyo University of the Arts & Nihon University) and 1 German (Stuttgart State Academy of Art and Design, Germany). As a closing remarks, Ms. AOKI Noe, sculptress and the winner of the first Takifuji Art Award, sent words of cheer to the students saying that sculptor or artist is not the occupation but it’s a way of life. Creation is a way to find own position in the world. After the ceremony, the students, teachers and guests participated to the social gathering. As the opening event, Mr. SAWA kazuki, an internationally well-known violinist and the president of Tokyo University of the Arts, played a beautiful ensemble with his family. Ms. TATENUMA Emiko, a spouse of Mr. SAWA, is also a famous pianist and their daughter, a violinist. During the gathering, which last almost 3 hours, the Japanese and foreign students including the teachers interacted each other, and the students got many useful advice from the teachers. Also each student gave the presentations on their artwork, and told about their ambitions for the future which received a warm applause from the guests. The day before, the students and the teachers participated in the tour to the Atelier Creare located at Atami, Shizuoka prefecture. In the Atelier, the group was explained by the staff how the public art of stained glass and ceramic relief was created. Afterward the group themselves had a workshop using the ceramic and stained glass and their artworks were displayed during the party.